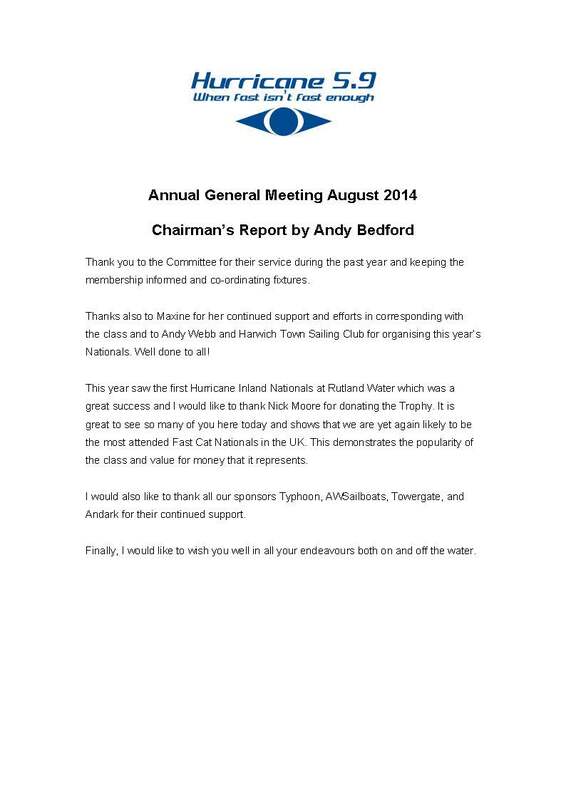 Please find below the Minutes and Chairman’s report from the 2014 Hurricane AGM held at Harwich. 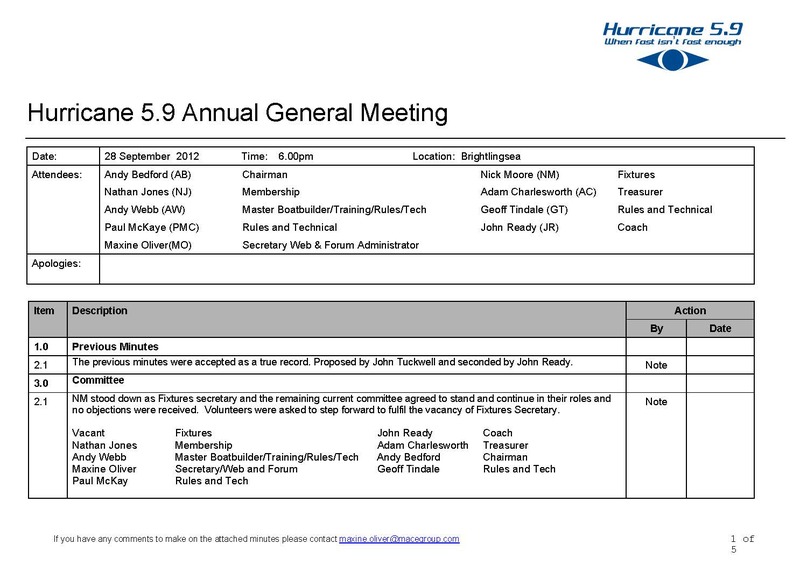 The next AGM will be held at the Hurricane Nationals at Thorpe Bay Yacht Club on Sunday 16th August 2015 at 6pm all Hurricane members are more than welcome to attend. Congratulations to the top three Hurricanes and to all that competed in each of the various races at the East Coast Piers held at Marconi Sailing Club across the weekend. We look forward to seeing you all at the Hurricane Nationals at Thorpe Bay from August 15th to 18th. 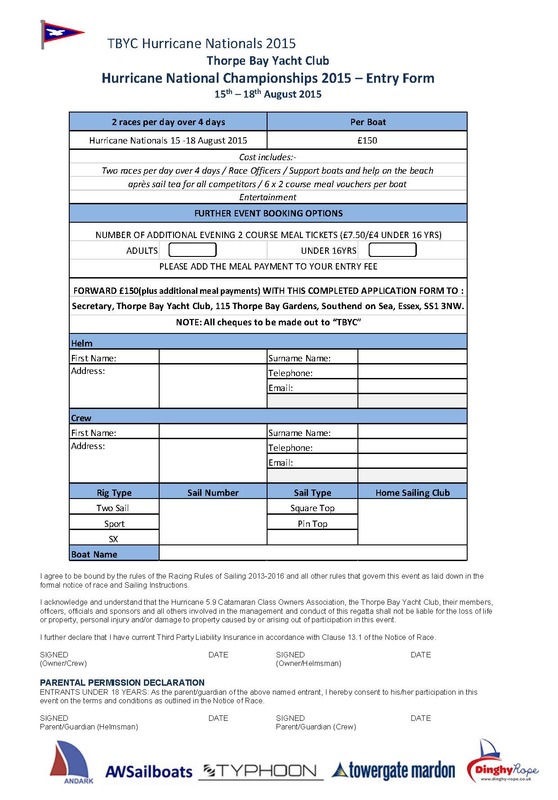 Hurricane sailors here is the updated entry form for the must go to event of the season the Hurricane Nationals at Thorpe Bay 15-18 August 2015. A full sailing and après sail has been organised over the 4 days and lovely sunny weather and a good breeze have been ordered. Fast Pedigree, Race Winner, top 10 last 4 Nationals, Travellers Series Winner. 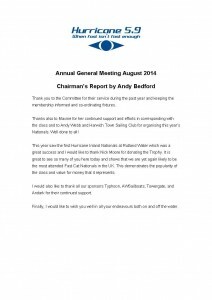 It seems like it was only yesterday that we were creaming along and enjoying the summer weather, the Hurricane Nationals remain the sailing highlight of 2014 for me. Moving on to business matters, I have received notification from the class sail maker that their material costs have increased yet again and can no longer be absorbed by them consequently all orders received after the 31st of December will be subject to a price increase. 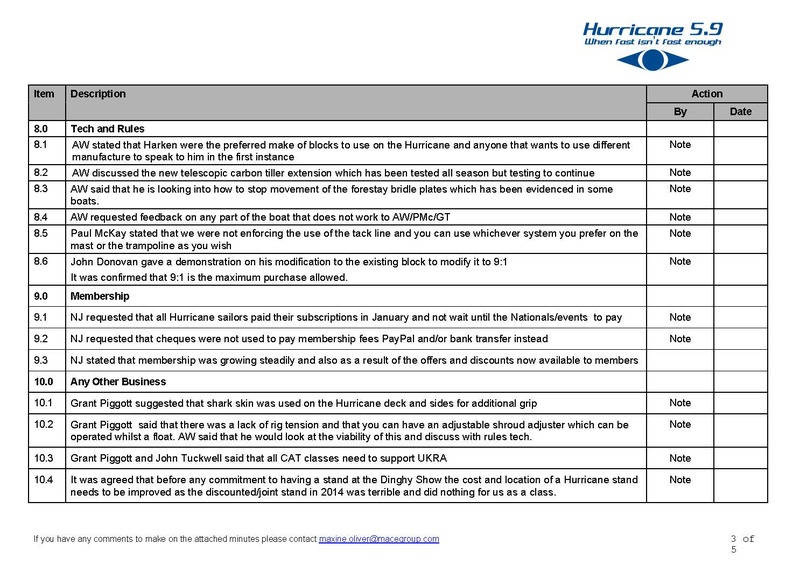 So, what are the new numbers and options…..
Well, the option of passing on a 10% discount for orders delivered on a three month lead time is still available, placing an order for a replacement main, trampoline or spinnaker before the 31st December will also avoid the price increase, so now is a great time to order for end of March delivery in time for the start of the new season. A mainsail under this 3 month lead time deal will be £1,035 (£1,185 rrp in 2015), a jib £320 (£365 rrp), a spinnaker £535 (£610 rrp) and a trampoline £247 (£285rrp). Terms are 10% deposit required and payment prior to delivery. Orders to be placed by the 31st of December, if placed after this date for a 3 month lead time the new rrp price will be discounted by 10%. Also consider that there are many Hurricane sailors out there who would be interested in buying used condition sails with a reasonable amount of service left in them, particularly the square top mainsail, it could be worth putting your original sails on the market. How’s your rigging looking ? Don’t take a risk, take advantage of the winter rigging pack deal, £295 (rrp£350) for a complete set (shrouds, diamonds, trapeze wires, jib halyard, bridle wires, forestay upper and lower). Treat your boat to a new heavy duty all over cover this winter for £345. I have settled on the tried and tested heavy weight PVC material with deeper side panels offering better UV protection supported by numerous quick release adjustable straps in all the right places. 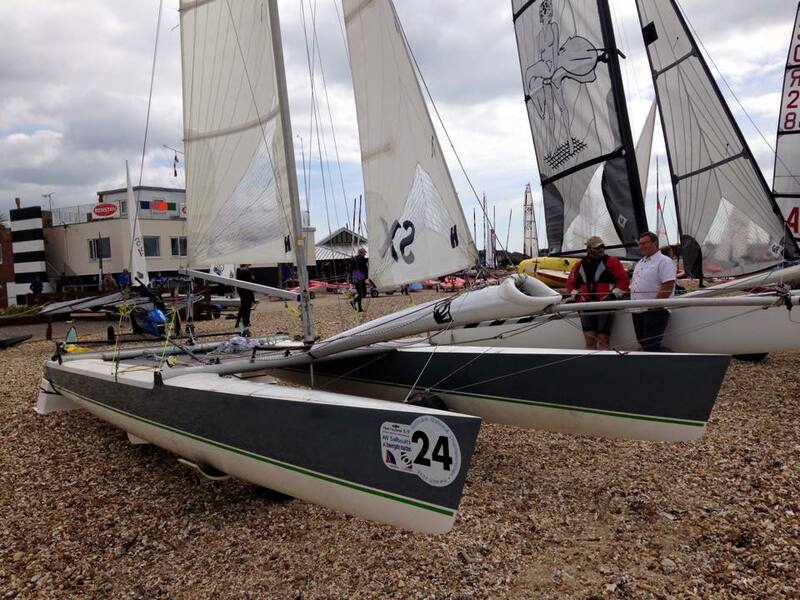 Harwich Town Sailing Club hosted the National Championships for the Hurricane 5.9 Catamaran Class over the weekend of the 9-12th August. Twenty eight teams travelled from as far afield as Dublin Eire, Wales and Devon. Competition was particularly strong this year with six individual teams with previous National and European Championship titles behind them taking part. Harwich Town SC proved to be ideally suited to host such an event with Harwich Green offering plenty of grassed area for rigging the boats and safe launching into the Harbour from the beach. The recently upgraded changing facilities and social area areas of the local club topped off the facilities for the visitors. Racing got under way on schedule at midday on Saturday under the management of principle race officer and club Commodore Didge Everett. The wind was blowing across the bay from a west by south westerly direction gusting up to twenty knots with a wind blown chop. 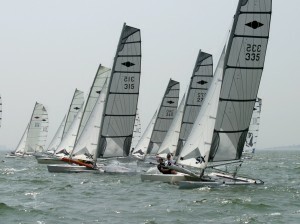 Ideal conditions for some fast and furious action yet testing on the crews’ abilities as any mistakes were punished by a capsize or high speed collision. The local Rescue boat team were kept busy with a dismasting and a number of capsizes throughout the session. Straight out of the blocks it was former class Champions Neil Connelly crewed by Dave Wood from Stone SC and Grant Piggott crewed by his son Adam Piggott from Weston S C pulling away from the pack to fight it out for first blood. Back in the main pack mixing it up were nationals newcomers Julian Reichart and Jeremy Sandford from Thorpe Bay YC battling with Jack Tindale and Hugo Bull from Stone SC taking on local pairing and former Champions back in 2005 Andy Webb and Paul Gray who had come out of retirement for the event. Gray’s pre-race preparation consisted of shirking boat maintenance were possible and a whopping Thai Curry washed down with copious amounts of lager on the pre-race night, couple this with the pairing’s pre-event tuning and practice session consisting of the sail out to the start line for race one these two were looking like has beens ! Team Piggott took the first race, Connelly second and by some miracle Webb/Gray managed to act on some favourable wind shifts to climb up to third place. In race two the weather conditions continued to hold up, this time Team Piggott made a good start to take the first windward leg and progressively build a safety margin of a lead over the ensuing pack. Reichart/Sandford revelled in the steady wind strength using their crew weight and stature to great advantage pulling out a second place . Enter the ‘heavy weather sharks’ of the fleet in the form of Mark Woods and James Heyes from Island YC mixing with another former Class Champion Ritchie Hanmore crewed by his brother ‘Rocket’ from Stone SC and another brotherly pairing of Trev and Kev Bawden also from Stone. Woods/ Heyes took a well deserved third place despite the pressure from the lighter pairings on the downwind legs. Webb/Gray were floundering having hit the pin end start buoy, after their 360 things got worse on board as Gray managed to wreck the spinnaker halyard system when trying to pull the spinnaker down at the leeward mark by mistakingly pulling the uphaul line. Rust stains could be seen leaching from the pairings wetsuits ! For race three the wind conditions had slightly increased, gusts occasionally hitting 24 knots, but the sea conditions had flattened slightly due to the falling tide. Webb and Gray drew a line in the sand producing an aggressive start probably help by a pre race application of WD40 inside their wetsuits. After an initial close tussle the locals found some of their old form and went into overdrive posting a comfortable horizon job win. Back in the pack team Piggott had started poorly and were fighting to get back into the race. Team Hanmore, Reichart/Sandford , and Connelly were not going to make it easy. The Piggotts managed to go into overdrive whilst under pressure to break through on the last lap and take a well earned second from Team Hanmore in third. 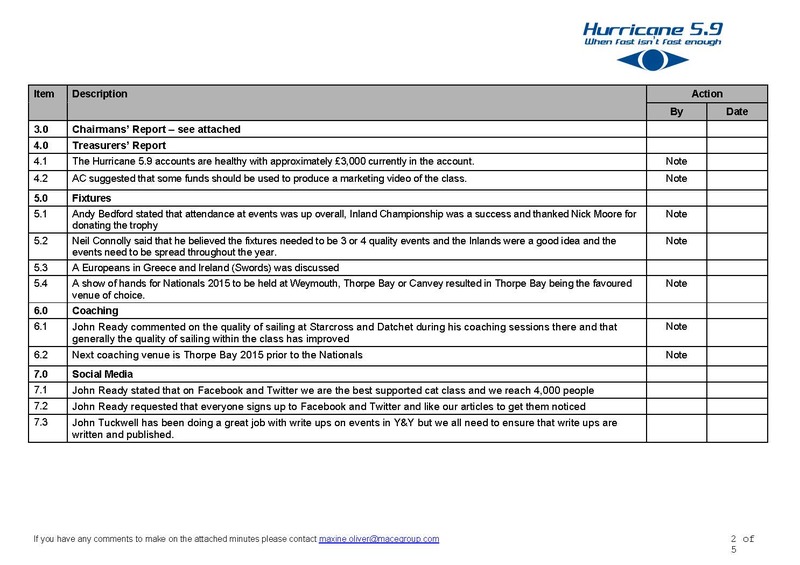 It was the turn of a different Hurricane to take centre stage on Sunday as Hurricane Bertha made her presence known. Conditions were un sailable and this continued into Monday with yet more racing cancelled. The visiting sailors were given a true Harwich Community experience with impromptu tours hosted by the Mayflower Project, Harwich Lifeboat Crew and the Harwich Society. Tuesday dawned bright and still Breezy. The Race Management Team decided to lay on racing for the fleet based on a forecast of decreasing wind. The remnants of Bertha had other ideas and the wind actually increased across the course with gusts of up to twenty six knots. Race four got off to a clean start and it was the Piggotts and team Webb/Gray who broke away from the fleet to thrash it out. Piggotts cleared the first mark just one boat length ahead of the local boys who were now feeling energised after a two day re-cooperation. During the downwind leg with spinnakers pulling and the crews wiring right off the transom boat speeds were estimated as being well into the 25 knot range. Half way down the leg a large gust hit Webb/Gray resulting in nose dive which catapulted Gray from the stern of the boat towards the bow which nearly caused a total wipe out. Somehow they managed to hang on and regain control but it was clear that the tactic of the day for these two was to survive the overpowering conditions. Team Piggott took the finish gun, Webb and Gray hung on to take a safe second, the heavy weather sharks (Woods/Heyes) sailed consistently for a third handed to them when Reichart/Sandford capsized at the leeward end of the course after a very close tussle throughout the race. The race management decided to hold a final race due to a slight ‘softening ‘ of the race conditions. With plenty of adrenaline still flowing from the previous race the fleet made a false start resulting in a general recall. At the restart the wind had increased further with gusts of 29 knots coupled with a rising sea. The scene was set for a testing race for all. 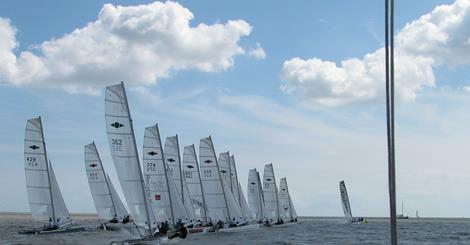 It was team Piggott and Woods/Heyes who took first and second place around the top mark with Webb/Gray a close third. By now Webb and Gray’s lack of fitness was showing, it was a battle against the elements and the heavier crews now chasing down the pairing who were giving away a four stone deficit in crew weight on the Piggotts (efficiently positioned in Adam Piggotts’ muscular upper body frame, his dad never looked like that when he was young…) and even more weight deficit on the ensuing pack, despite Gray’s beer belly. Team Piggott kept their foot to the floor to take the finish line and seal a solid championship win whilst Webb and Gray managed to overtake the Sharks and hang on by their shirt tails to survive and take second place and a firm second championship place overall. Reichart/Sandford took another swim! The event was generously sponsored by the following organisations in no particular order, Towergate Mardon Insurance, AW Sailboats, Andark Marine, Typhoon, Shepherd Neame. Meet the Team at Harwich continued….. 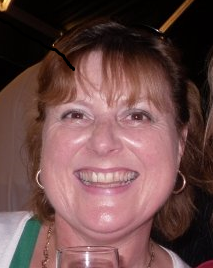 The fantastically efficient and seriously hardworking Shirley James is Harwich Town Sailing Clubs’ Honorary Treasurer. Shirley has been the dynamo that is powering the behind the scenes action in preparation for your National Championship event . The numerous tasks undertaken range from signing up the band, booking you guys into the Firestation accommodation, handling your entries, sorting the catering, the list goes on ….! Shirley’s family will all be taking an active role in the event with her husband Colin and Son Rob afloat as part of the rescue boat team. He’s the man to see if you want to know anything. Set your Sat Nav to CO12 3NJ then do what you’re told. Otherwise: go to the Easterly end of the A120. 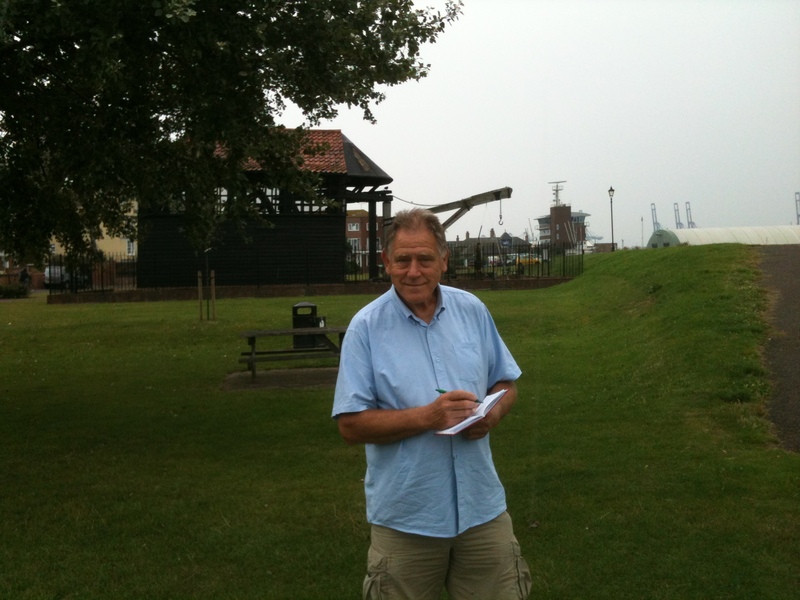 As you come to Harwich Quay there’s a mini roundabout …. Drive onto Harwich Green between the cones. There’ll be one or two signs to reassure you. When you arrive choose a bay for your boat and trailer in the marked out area over by the sea wall – and park up in the area set aside for vehicles – then come to the club to check in. Someone will be about to assist. With the 2014 Hurricane Nationals less than a week away this year’s event is shaping up to be one of the best and most competitive for years. Pre entries currently stand at 35 which are the highest since 2005. 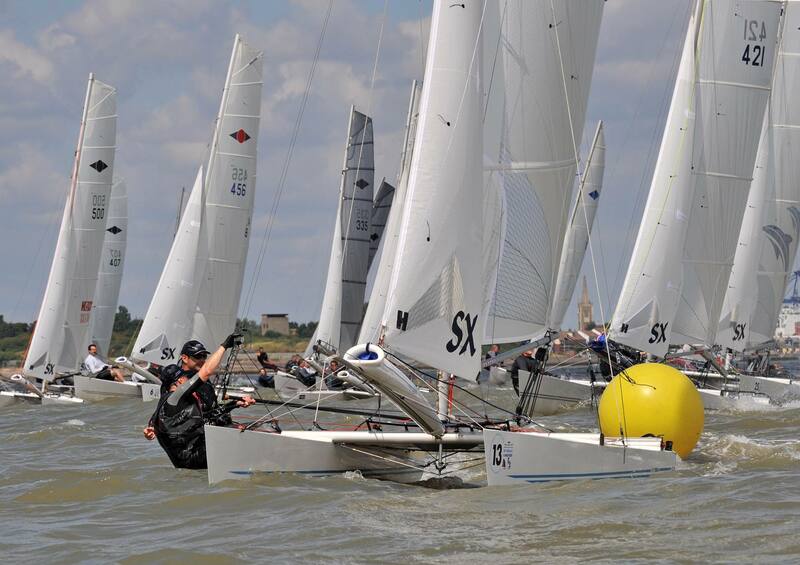 The event is being hosted by Harwich Town sailing club who last hosted the event in 2005 and although the club is not recognised as a major regatta event the view is taken that when they host an event they make sure they host a good one. 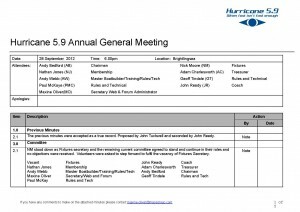 The Club have the added advantage of Andy Webb, class builder and long-time supporter being involved, as it is his home club, to ensure that the hurricanes are well looked after. John Tuckwell and Chelsea Furber. Winners of the Datchet and Bala open meetings. 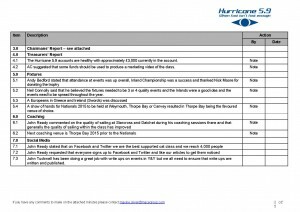 John long term support of the Hurricane and is here due to the length of time in the class. 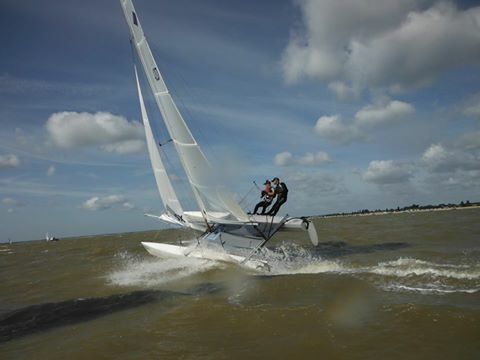 Has certainly found speed sailing with his step daughter Chelsea Furber who has only been in the class for two years previous sailing toppers. 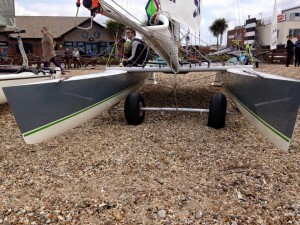 Good at Inland events where they can smell out the shifts but will struggle in sea conditions. Kevin and Trevor Bawden. As brothers who have campaigned their own boats they have both come together for this season and have proved to be quick. Kevin won the Canvey open meeting and 3rd at the Stone event. Both have substantial experience in the class and as brothers will gel as a crew it will just depend if they do not get too phased out by the event. Richard and Chris Hanmore. 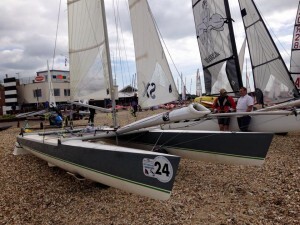 Another long-term Hurricane sailors with Richard a previous National Champion as both helm and crew. This year Richard is also sailing with his brother Chris again long time super crew. Both showed speed at the Stone event which was their first outing this year finishing second. Richie is quick on any given day and in any given conditions and with brother Chris who is a steadying influence this is a strong pairing Jack Tindale and Hugo Bull. Another new pairing for this season and their first event was the Stone event which they won 5 of the 6 races against a very competitive fleet. Jack has the Tindale DNA in his blood which has been passed down from his father Geoff and for whom he regularly crewed for. Both have substantial event experience but will they have the speed on the day?? And then there are the stalking horses, the ones that the fleet need to be afraid, very afraid of. Andy Webb and Paul Gray. Andy is the Yoda, the Guru of the fleet. Hurricane sailors in dinghy parks all over the UK still speak of Andy’s tuning tips in hushed tones. Paul makes an art of sledging the competitors, the Australian cricket team would lean a lot from Paul and his on and off the water comments. Last time Andy and Paul sailed together was in 2010 when they battled against the three sailed boats in the old two sail mode and still ended up 3rd. This year they do have the advantage of the extra sail so with this and the year and years of experience it would be a brave man not to bet against this pair. Grant and Adam Piggott. 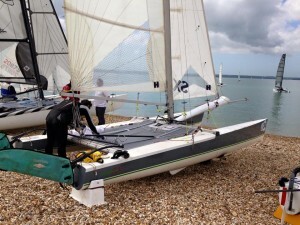 Grant is multi F18 winner and the pinup for NACRA in the UK. He is sailing with is son Adam who has taken a break as professional crew on the GC32 catamaran series. Need we say more??? As father and son both and enormous amounts of experience that they can draw on, it will just depend if they can sail together and not be affected by father / son bonding and the barrage of sledging. They just happened to be in the area for a wedding is their excuse for attending the event but clearly they could not resist resuming old east coast rivalries. Neil Connelly and Dave Wood. Neil another multi-winner Hurricane sailor who has made a return for a last chance of glory. Sailing with Dave Wood who will no doubt provide the engine around the boat all Neil needs to do is steer in the right direction. This is a strong pairing, it will just depend on Neil body holding up including his back and knees during the event. Neil may end up writing cheques his body may not be able to cash. These are only 7 teams which may be in with a shout. No mention has been made of the teams from Thorpe Bay including Nick Elmore sailing with is son or the Palmer brothers and the other 4 boats. This does not include the Starcross sisterhood which includes the evergreen John Donavan and the other 3 boats or Stone Massive all of whom have been practising and all have the potential of producing results on the day. 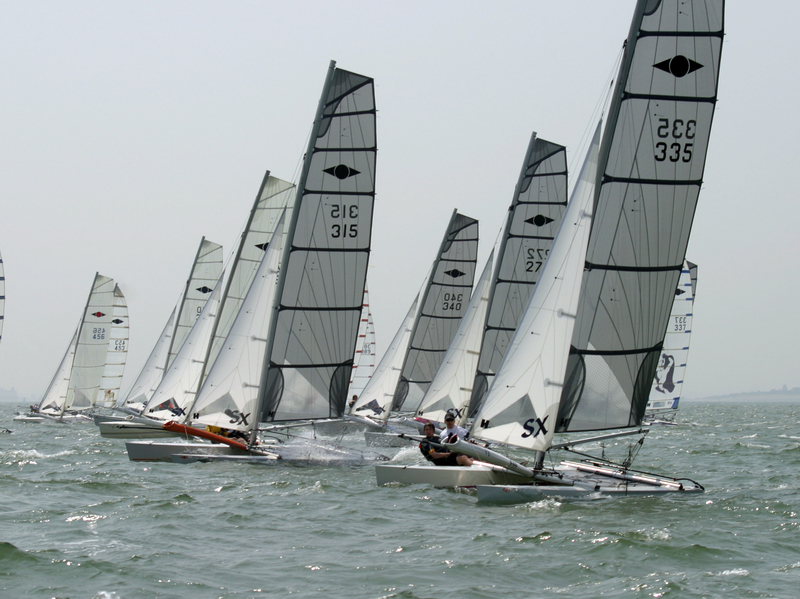 One noticeable change in the fleet is the increase of father and son/daughter teams and the mixed teams. This is evidenced by Nick Moore and Oliver who have shown good speed at opens. Long standing helms are now sailing with younger fitter crews as seen with Geoff Tindale who is sailing with Johnny Van Ingen and class chairman sailing Andy Bedford sailing with Arthur Brooks, both are new crews this season. This influx of youth in the fleet have assisted some of the older sailors and has made evenings a little more entertaining rather than just sitting around talking about former glories. The hurricane fleet is going through a mini resurgence helped by the value of money that a boat can be purchased for, competitive sailing and strong support from sailors within the fleet creating good atmosphere both on and off the water. 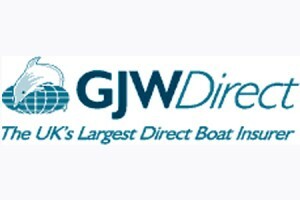 As with all major events this would not happen without the support of the class sponsors, Insurance4dinghies by Towergate, Andark, Typhoon and A W Sailboats. 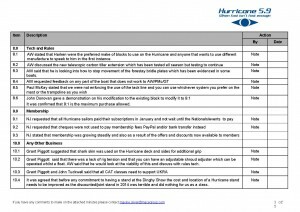 Given the interest the F18 worlds generated when hosted in Ireland this year’s Hurricane Nationals are shaping up to generate just as much interest within the UK catamaran community and beyond.